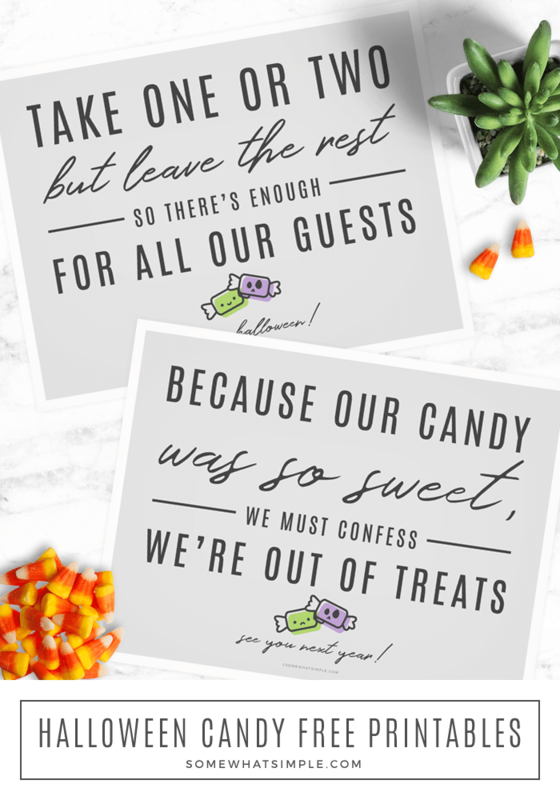 We love these simple Halloween Candy Signs! 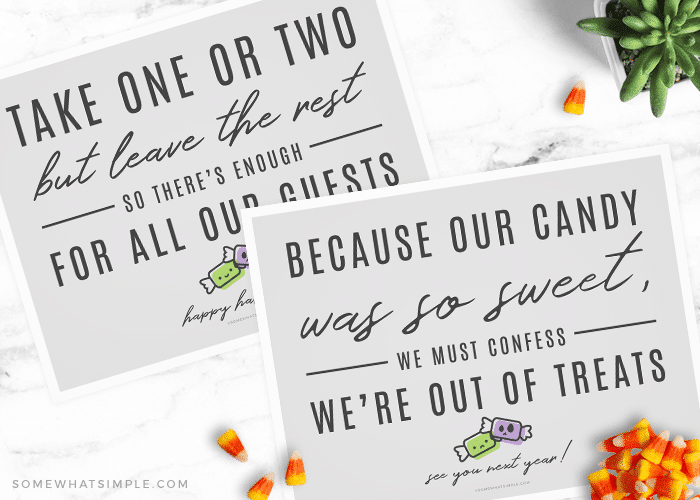 Just print and place, and let Trick-or-Treaters know how many pieces to take, and when you’re out of candy! Does anyone else have a problem with late-night trick-or-treaters coming to your door long after your own kids are in bed and your lights are out? I decided I needed something to let the neighborhood kids when we were done with all the Trick-Or-Treating festivities, and so I created this Halloween Out Of Candy Sign. Once my family goes in for the night, the sign goes out and so do our lights. Trick-O-Treaters (usually) know not to knock or ring the doorbell once the sign is out- it is a must-have for Halloween! Print out your sign and trim around the edges if necessary. Tape it to your front door, or frame it and hang it if you want it to be a bit more festive! 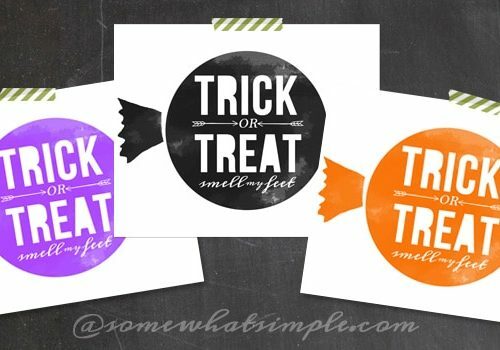 Ready to download your own Halloween Signs? 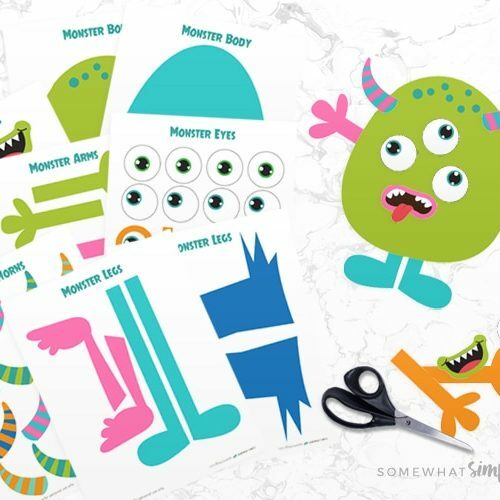 *As with all the free printables that we offer here on Somewhat Simple, this design is for personal use only. Please do not sell or distribute this print without permission from Somewhat Simple, LLC. Thank you! Absolutely love this idea – and love your frame even more!! Where did it come from? And how does your frame look like it’s hanging perfectly on ribbon on your door? I haven’t had the popup since! Thanks again for taking the time to fix it! No problem! Thanks for taking the time to read your comments and reply! I can’t wait to print this and get it ready for Halloween night! “I made it a point to block inappropriate ads and popups (the invasive ads) before I set it live. More than likely, your readers won’t experience this anymore, but if they do, please let me know and I’ll track down the issue. So if you still get the annoying pop up, let me know but hopefully it has been taken care of! Fingers crossed! 🙂 Thanks Daphne! Love this! 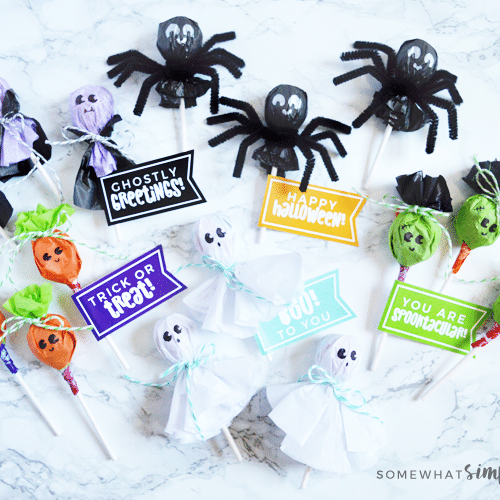 We have380 treats and are sure to run out in our neighborhood so I’m sure I’ll use this! FYI the video popup ad at the top of your blog is a mega pain…I read on a mobile device and it is very hard to get past the ad to read your posts! I’m glad you like this idea! And honestly, I had no idea there was a pop-up video on the mobile version of my site- that is super annoying!!!! I just emailed my tech guy to figure out what is going on and how we can get rid of that- thanks for the heads up! I love this idea! We used to always have this problem! I thought everyone knew the lights out on the porch trick meant that people were closed up for the night. We always had older kids knocking on the door well into the evening. I’m going to share this with my readers. Thanks!